Looking for a cheap ticket to Bangkok? Here you can search all major low-cost airlines for cheap flights to Bangkok. Before you book a flight you can use Utiket to find the cheapest flights to Bangkok for Thai Airways (TG), Thai AirAsia (FD), Bangkok Airways (PG), AirAsia (AK), Thai Lion Air (SL), Thai Smile (WE). All flight data are real-time and accurate. Follow the links to search and book your cheap ticket to Bangkok directly with the airline or one of our partnering travel agents. The metropolitan area of Bangkok is being served by several airports: Suvarnabhumi Airport, Don Mueang International Airport. You can find more information or the cheapest tickets to all these airports here on Utiket. Bangkok Suvarnabhumi airport (also known as Bangkok International Airport) is the main entry point into Thailand. The airport was build in 2006 at a cost of US$ 3.8 billion to replace the aging Don Muang airport north of Bangkok. Read more about Bangkok Suvarnabhumi Airport. Don Mueang International Airport is the former Bangkok International Airport and now operates as a low-cost airport. The airport was officially opened on March 27, 1914 as a Royal Thai Air Force airport. In 1924 Don Mueang Airport commenced on commercial operation too with the arrival of the first commercial KLM flight to Don Mueang. Read more about Bangkok Don Mueang International Airport. This is a list of all airlines flying to and from Bangkok and how many flights and destinations they serve. 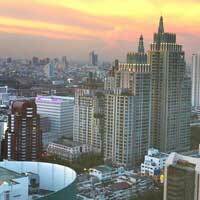 You can see a complete list of airlines and flight options to Bangkok.